Philippine sugar mills have an average age of about 50 years, leaving many of them ripe for the rehabilitation and upgrading of their automation controls. The imminent implementation of the ASEAN Free Trade Agreement (AFTA) and agreements of the World Trade Organization (WTO) also pressure the mills to consider more advanced automation solutions. 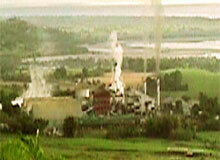 The majority of the local mills have capacities that are less than 5,000 tons of cane per day. This poses a limitation and a challenge as to the degree of automation that mills will be able to adopt. URSUMCO is the first to be convinced that an integrated automation solution is needed to face the challenges of the future. The Plant Manager was the champion for the project. A complete road map was developed to automate as much of the factory as possible. The plan demanded a system with high reliability and high availability and a long-term relationship with the control system vendor. CENTUM CS 1000 and Yokogawa Philippines (YPI) fit the bill nicely. YPI provided a complete instrument and control solution package which included supply of Brix sensors, valve actuators and control valves.